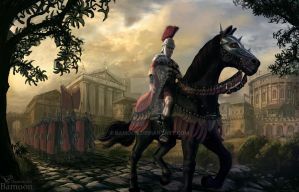 Concept art for the Rome II. Siege battle in the Middle East some two thousand years ago, when the Roman legions are trying to take the Persian city. My most complicated work recently, especially the characters were a pain to do. а, видел в моде divide et impera для rome 2. So YOU are the one responsible for the Rome 2 artwork. My hats off to you! Wow... I've been watching your amazing work for a while and had no idea you were responsible for the 'Rome 2' art. Recently been playing it and, I have to say, the art which comes up in response to events REALLY helps to sell the atmosphere. Every time I see it, I wonder who should be thanked for helping to immerse me so well in the time period. Now I know! I love your work, my friends and I comment on how great it is whenever it comes up in the game. It really immerses me in the time period, the stuff you did for Empire Total War is also great. But worth your time, well done, wow! awesome but this is in the game HOW? He did the art for the game, that's how. sorry, cant. it a commission done for total war. Roman armor is really hard to paint but your work is excellent! Amazing work ;D. Unfortunately the game is a re-run of the Hollywood theme, while any extra factions you have to purchase. Highlight with the EB mod was that well it was much more accurate and had most of the actual factions. Your work however is one really good highlight of the game, as well as the graphic craftsmanship that will go into making it. It could be the vain attempt of emperor Trajan in 117AD to conquer the City of Hatra. I had something similar on mind. In twohundred years, people will still look at this and think: "Wow!" It's simply impressive (and expressive! )! Nice, the wall and cloud texture is superb. Very Well Done! You can feel the heat and smell the smoke! my god!!!! so in love with this!!! wow, excellent work! Raw and atmospheric... great!